With the proliferation of prescription drugs came one unintended consequence: the increasing use and abuse of heroin in the United States. Heroin has become such a significant issue that it is now considered a full-scale national epidemic. The use of opioid prescription drugs to treat pain has created a culture of dependence that affects adults and young people alike. As heroin ravages American communities, more and more people are becoming stuck in its vice-like grip. New Jersey strictly prohibits the possession and distribution of heroin, imposing severe penalties upon convicted heroin offenders. A skilled criminal defense attorney can ensure that you pursue any and all viable alternatives to incarceration, and if the charges are unfounded, can vigorously protect your innocence at trial. William Fay is a seasoned criminal defense lawyer who has been dedicated to defending the rights of his clients in New Jersey for years. Throughout his distinguished career, Mr. Fay has utilized skillful negotiation and a ferocious trial strategy to achieve superior results for clients in Pennsauken, Camden, Cherry Hill, Pine Hill, Bellmawr, Runnemeade, Waterford Gloucester and Haddon Twp. Mr. Fay couples his expertise in defense with his prior experience as an Deputy Attorney General for the New Jersey Attorney General’s Office. By understanding the way in which the State prosecutes these cases, he is able to identify and compile evidence to create your most effective defense. For additional information and to speak with Mr. Fay today, contact his offices at 609-832-3202 for a cost-free consultation. 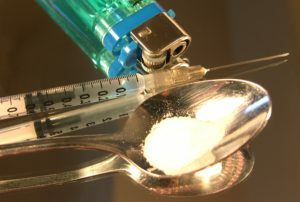 It is unlawful for any person, knowingly or purposely, to obtain, or to possess, actually or constructively, a controlled dangerous substance or controlled substance analog, unless the substance was obtained directly, or pursuant to a valid prescription or order form from a practitioner, while acting in the course of his professional practice, or except as otherwise authorized by P.L.1970, c.226. Any person who violates this section with respect to a controlled dangerous substance, or its analog, classified in Schedule I, II, II, or IV other than those specifically covered in this section, is guilty of a crime of the third degree. Heroin is classified as a Schedule I drug in New Jersey’s Drug Schedule. As such, possession of heroin is a third degree crime and may result in consequences including: a 3 to 5-year term of incarceration, a fine of up to $35,000, a felony conviction on your criminal record, and a 6-month period of driver’s license suspension. Quite obviously, prison does little to assist heroin users in recovering. Fortunately, when you are charged with a heroin offense in New Jersey and you have no prior criminal record, jail is not your only option. You may be eligible for probation or one of the State’s diversionary programs such as Pre-Trial Intervention or Drug Court. If you or someone you love has been charged with heroin possession, heroin distribution, or another drug crime in Camden County or elsewhere in South Jersey, it is highly advisable to enlist an aggressive legal advocate as soon as possible. Contact our firm at 609-832-3202 for additional information and a cost-free consultation.